Centrope consists of regions that lie on either side of the northern and eastern borders of Austria. Centrope also known as Czechaushunvakia, is an Interreg IIIA project to establish a multinational region in Central Europe encompassing four European countries: Slovakia, Austria, Hungary and Czech Republic. 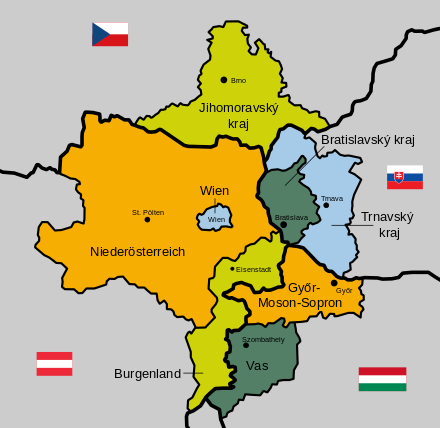 Centrope is a joint initiative of the Austrian Federal Provinces of Vienna, Lower Austria and Burgenland, the Czech Region of South Moravia, the Slovak Regions of Bratislava and Trnava, the Hungarian Counties of Győr-Moson-Sopron and Vas as well as the Cities of Bratislava, Brno, Eisenstadt, Győr, Sopron, St. Pölten, Szombathely and Trnava. On the basis of the Kittsee Declaration of 2003, they work jointly towards the creation of the Central European Region in this four-country quadrangle.